Most people think that robot vacuum cleaners are a waste of money. They believe that the little droid’s vacuuming ability is limited to hardwood floors and thin carpets. And why spend money on a floor duster when you can get a sturdy, heavy upright vacuum instead? Here’s why: self-driving vacuums can do so much more than just dust your floors. They can complete your day-to-day chores in a matter of minutes. They’re a powerful piece of machinery that can sweep, mop, and vacuum your floors while you can catch up on some much-needed sleep. Our list of the best robot vacuum cleaners of 2019 will help you find the best self-driving vacuum for your house or apartment. Don’t condemn yourself to lug around a massive, 50-pound upright vacuum. Sit back, relax, and let a compact, powerful machine complete your chores for you. These next few sections will tell you all you need to know which unit you should get and how you can get them. So, go ahead and check out our in-depth reviews. If you’re interested in purchasing a robot vacuum, you should check out our detailed comparison table. Our comparison table looks at each droid based on their dimension, weight, and rather or not it has a HEPA filter. We created this chart for those looking for the top robot vacuum cleaner currently on the market. If this pertains to you, then go ahead and take a look at our table of the top 11 rated robot vacuums of 2019. To provide a more thorough understanding of our top 11 choices, we compared our picks based on dimension, weight, warranty, filter type. We chose dimension and weight to provide a better idea of how large and bulky the machine is. This is especially useful for individuals who would like their unit to slip behind or underneath their furniture. Then, we chose to look at the robot vacuum’s coverage because warranties protect against defects in materials and workmanship. Warranties guarantee that you don’t waste your money on faulty appliances. Finally, we compared rather, or not the unit came with a HEPA filter. HEPA filters are guaranteed to protect against 99.99 percent of dust and debris in the air. It’s the best filtration type for individuals with asthma, colds, or respiratory problems. Next up, we have our in-depth reviews. If you want to know which units we consider the best of 2019, then I recommend that you keep reading. If you are living on apartment, Roomba 880 is a great choice for you. The Roomba 880 provides five times the suction average suction power of compared to the next best-selling robot cleaner. This cleaner shippeds with the XLife Extended Battery which offers an extra-long battery life. Not only that, but this handy appliance’s runtime doesn’t change or shorten with time or age. It also features a handy self-charging feature that prompts and navigates the robot back to its charging dock. This guarantees that it’s ready and fully-charged for its next cycle. Moreover, the 880 is equipped with iAdapt Responsive Navigation. This helps it navigate around furniture, stairs, and clutter all around your home. Its 3-stage System combines a powerful suction, rotating brushes, and movement for perfect dust-free results. In addition, it features spinning side brushes. It’s ideal for digging out dirt from not only carpet but also edges behind and between furniture. Nevertheless, what’s most impressive is its Virtual Wall/Lighthouse Devices. Its Lighthouse mode prompts the drone to clean up to 3 rooms thoroughly. Meanwhile, the Virtual Wall mode prevents it from entering any room you don’t want it in. Unfortunately, the Roomba 880 is a bit noisy. You ought to lock up your pets while you let this robot vacuum clean. Like most self-driving vacuums, it’s not ideal for digging dirt or grime from the base of your carpets. It’s also not the best for cleaning corners. In addition, you can prompt the robot 880 to follow a 7-week schedule for regularly scrubbing your home or apartment. It’s designed to work on all floor types, including carpets, hardwood, cement, tiles, rugs, and more. It also utilizes with an AeroForce High-Efficiency Filter for filtering out dirt, debris, and grime. The robot 880 utilizes with multiple features for thoroughly dusting your house or apartment. It’s easy to use and, on average, it tends to last years. You can’t go wrong with this handy machine. Next up is the Roomba 650. The Roomba 650 is an excellent miniature self-driving machine for reaching tight corners and under furniture. It features a 3-stage System for collecting large debris and pet dander, like cat and dog hair. This handy appliance boasts a scheduling system which allows you to set its chore schedule for the week. Its Self-Charging feature prompts the unit to automatically return to its charging dock when its battery is low. What’s more, the 650 boasts with the iAdapt Responsive Navigation system. The iAdapt Responsive Navigation system helps this self-driving cleaner navigate around clutter, stairs, and furniture in your home. It features a low profile which is perfect for slipping under tables, chairs, and couches. This item also has with Virtual Wall Technology which prevents the unit from entering certain rooms. Furthermore, its Spinning Side Brushes is ideal for digging dirt off walls and the backs of furniture as it slips past. Overall, the robot 650 is affordable, easy to use a cleaner that’s perfect for both small and large homes. The downside to the Roomba 650 is that it doesn’t have an HEPA filter or a great filter of any kind. Its dust collection bin could be a lot bigger. Also, it could do a better job at digging dirt out from between cracks or crevices in wood or tiles. Finally, it’s important to note that like all vacuuming machines, this unit is a bit loud. The 650 can quickly transition between floor types. Furthermore, it’s designed to clean all floor types, including hardwood, cement, tiles, carpets, rugs, and more. 3.6 inches tall, this machine is specially designed slip beneath and around most furniture. We were pretty happy with the 650. Although we felt that the 880 performed a bit better, the 650 was almost as impressive. You can rely on this machine to slip under furniture and collect any hidden dust. Next on our list is the Monoprice Strata. The Monoprice Strata has an Anti-Drop Sensor which protects this appliance from falling down the stairs. Meanwhile, it also boasts an Anti-Collision Bump Sensor which protects it from running into furniture and other obstacles. Its Multi-Surface Transition feature allows it to sense and adapt to any floor type. So, if it was scrubbing a carpeted floor and then a hardwood floor, it can decrease its suction in a matter of seconds. Moreover, the Monoprice Strata built pre-set with three different modes. Its modes vary based on present obstacles, floor type, and the amount of open space available. Obviously, this guarantees a thorough washing with every use. Its 10-watt motor can handle enormous amounts of debris and dander, including dirt, dog hair, and mold. Furthermore, this self-driving which has dual-side brushes for a wider, more exact path. It also features a compact, simple design sitting roughly 3.34 inches tall. Obviously, it is as good as any best-selling upright vacuum currently on the market. Honestly, the Monoprice Strata is a bit loud. This might not be the best vacuum cleaner for a home filled with pets or young children. It also tends to get stuck in corners or fall stairs. Because of this, it can be a bit stressful to work with. The Monoprice Strata is an easy to use product that can provide years of perfect results. It has a 30-day money back guarantee, as well as, a 1-year coverage. Like all warranties, it’s coverage protects against defects in materials and workmanship. Also, this cleaner’s manufacturer has a technical support contact line, as well as, a customer service line. So, if you ever have questions involving this self-driving compact cleaning machine, just contact them. Despite its tendency to get stuck in corners, the Monoprice Strata has an impressive navigation system. If you’re looking for a vacuum that can take care of itself, then this is your best bet. The Samsung POWERbot R7040 offers 20 percent more suction power compared to the next leading brand. It features a wireless connection so that you can control the POWERbot via a smartphone and tablet. You can also control it with your voice via Amazon Echo. This powerful self-driving device also has a handy app that features a Coverage Map. The Coverage Map charts out where it has cleaned and where it hasn’t. Its Edge Clean Master Technology utilizes a handy shutter function which digs out dirt and dust from the corners of your walls. The Samsung POWERbot R7040 is equipped with a built-in digital camera. In addition, its nine smart sensors help to plot the best path through your home or apartment. It also takes into consideration potential obstacles, such as stairs, furniture, and even clothes. Moreover, this best vacuuming machine features CycloneForce Technology which utilizes centrifugal to prevent dirt from clogging it. It also uses Intelligent Power Control to automatically detect the surface type and increase, or decrease suction power. This provides optimal and remarkable results no matter the floor type it cleans. It should be no surprise that the Samsung POWERbot R7040 is one of the most expensive units on our list. While it’s not extremely expensive, it does cost more than most upright vacuum cleaners. It also doesn’t sell with a product warranty for protecting against defects in materials and workmanship. Finally, it’s important to note that its height is set at 5 inches. So, it’s not the best at cleaning under furniture or slipping under a bed. The Samsung POWERbot R7040 is equipped with EasyPass Wheels. These are large wheels which are perfect for thick carpets and, as well as, hard floors. This item utilizes a wide motorized brush to loosen dirt and debris from the base of your carpet. The POWERbot has a recharging dock which it returns to when its battery is low. It also features a washable filter, as well as, a schedule function for pre-programing it to clean throughout the week. The Samsung POWERbot R7040 is easily one of our favorites. It utilizes numerous easy to use features and functions for optimal results. Although it doesn’t sale with protection, you don’t need one for this durable, one-of-a-kind vacuuming machine. Next on our list is the bObsweep Pet. The bObsweep Pet features a chic design which can pair with any home or business. It utilizes a long-lasting battery zoom around your home for up to 1 hour and 30 minutes at a time. This handy carpet appliance features a 5-in-1 System. The 5-in-1 System includes sweeping, mopping, and vacuuming, as well as, UV sterilization and a HEPA filtration unit. HEPA filters are guaranteed to collect 99.99 percent of dirt and dust in the air, which makes them the superior filtration system for individuals suffering from allergies or respiratory issues. In addition, the bObsweep Pet is equipped with Edge Obstacle Sensors. These sensors allow it to avoid stairs, furniture, and any other obstacle that might block them. Moreover, its Multi-tier brushes use a mix of rubber and stiff bristles for the extra force to dig out dirt and debris. This handy self-driving has a bObi Pet feature which automatically cleans dog or cat messes. It also boasts a washable dustbin for quick, stress-free garbage removal. Finally, the bObi Pet’s shipped with a recharging station. When its battery falls below 15 percent, it automatically returns to the station to recharge. Unfortunately, the bObsweep Pet can run through its battery fairly quickly in a large home. So, most of the time it’ll be running back and forth from its charging dock. It tends to get stuck on thick carpets. This machine is designed to clean hard floors, such as wood and cement. While it can handle thin carpets, it’s a bit useless on thick carpets. The bObsweep Pet brags Touchscreen Buttons on its top. There are only three buttons, such as Go, Waffle, and Juice. Juice, course, prompts it to return to its charging station, while Go prompts it to start. Waffle prompts it to shut-off or pause. This machine utilizes a bObi blOck which lets you create invisible lines around your house or apartment. As a result, the bObi blOck is prevented from entering or leaving any room you want. This unit also has a 2-year limited coverage that protects against warranties. The protection guarantees that you get exactly what you’ve paid for. The bObsweep Pet is a crowd favorite. Even if you don’t have pets, you won’t be disappointed with the bObsweep Pet. The ILIFE A4 is a great, revolutionary item that can work on the thickest of carpets. Its 3-Step System uses an ultra-strong suction to pick-up large dirt and debris around your house. This system also features rotating blade brushes and side brushes for digging dirt out from the base of your carpet and the edges of your wall. It is equipped with a 2600mAh battery which features Fade-Free Technology for a 120-minute battery life. This handy, compact item has Tangle-free sensors so it can easily slip beneath and around furniture without stopping. The ILIFE A4’s built with a Max mode for focused, deep cleaning on a particular spot. It has an Advanced Motor which provides less noise with each performance. This cleaner has a recharging dock which it’s prompted to return to when its battery is low. You can also pre-set its schedule for the week. This guarantees that your home will stay dust and dirt-free all week long. It’s important to note that the ILIFE A4 isn’t built with the best navigational features. This means that you might have to robot-proof your home by moving wires and electrical cords. This self-driving vacuum tends to stop running randomly. It also features a less than durable design, and it quickly breaks if it falls down the stairs. So, if you have a lot of stairs in your house, you might want to avoid this vacuum cleaner. The ILIFE A4 has a reusable HEPA filter. HEPA filters are guaranteed to filter out 99.99 percent of dirt and debris for fresher results. Furthermore, it has a small, thin profile which makes it perfect for getting under furniture and appliances. Nevertheless, this doesn’t sell with a product defense. However, you might be able to pick-up one if you decide to purchase it via a 3rd party vendor. The ILIFE A4 works well on thick carpets and rugs. You might want to get an upright vacuum if you have a house with fully carpeted floors. Otherwise, it can handle occasional thick carpeted floors. The ECOVACS DEEBOT M80 Pro is a powerful unit from an extensive line of home appliances. It’s built with a convenient ECOVAC App which provides the ability to control it via your phone or tablet. You can also use the app to schedule its cycle. On this note, it’s important to mention that the ECOVAC DEEBOT’s Time Scheduling Function. The Time Scheduling Function allows you to pre-program it to follow a pre-set schedule throughout the week. The ECOVACS DEEBOT M80 Pro features three modes: intensive, edge, and spot. Its Intensive mode uses rotating brushes and a powerful suction to collect dirt and dust. Edge mode focuses the suction and brushes on the edges and sides of your walls and furniture. Finally, the Spot mode is ideal for digging out dirt or removing a stain in a particular area. The ECOVACS DEEBOT M80 Pro uses V-shaped brushes to dislodge and lift stubborn, stuck in grime and dirt. It works on both hard floors and thick carpets for a clean, fresh result. Despite its exceptional navigational features, the ECOVACS DEEBOT M80 Pro has difficulty locating its charging dock. It sometimes doesn’t even return to its charging dock when the power runs low. While the Anti-Drop system is an impressive addition, it, unfortunately, doesn’t always work. Luckily, this robot vacuum cleaner is sturdy enough to withstand a couple of falls. The ECOVACS DEEBOT M80 Pro features a 5-stage system. This system not only sweeps, and vacuums, but also mops, dries and lifts dirt and grime. It’s three Anti-Drops systems which allow the vacuum to clean around stairs without falling. This is because the Anti-Drop system detects any sudden dip or drop larger than 3.1 inches. Its Anti-Collison Sensor provides the ability to identify and avoid obstacles, such as furniture and clothes. We liked the ECOVACS DEEBOT M80 Pro. It came with a wide variety of additional features and abilities. It would have rated higher on our list if its suction was stronger. Next up is another Roomba 980. The Roomba 980 requires four rechargeable AAA batteries to clean your home. Along with the batteries, this unit boasts a handy recharging station which it returns to when the batteries run low. It can run for roughly 120 minutes for maximum results. At just 3.6 inches tall, it can easily slip beneath and around furniture. With its AeroForce System, it features a super powerful suction for rugs and thick carpets. It’s guaranteed to perform great on all floor types, including hardwood, cement, carpets, and rugs. The 980 features iAdapt 2.0 Navigation which helps it navigate your home. The navigation system helps it keep track of where it’s cleaned and where it hasn’t. 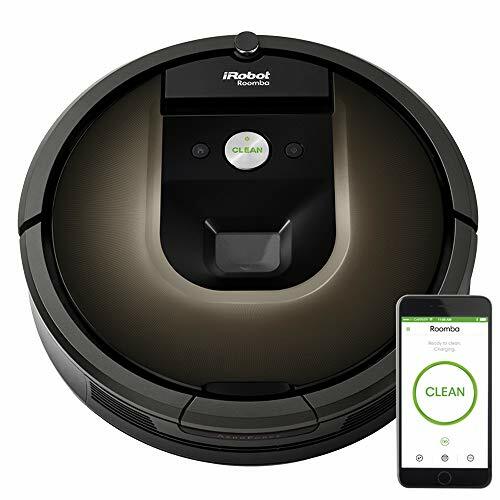 In addition, this self-driving vacuum’s sold with a Wi-Fi connection which lets you control it via your tablet and smartphone. You can also use Voice-Activated controls to direct your robot via Amazon Alexa and Google Assistant. Simply use three simple words to start, dock, and turn off the cleaner. First off, it’s important to note that the Roomba 980 is the most expensive unit on our list. It costs almost one-thousand dollars. And, while it is impressive, it’s a bit over-priced. Its WiFi connection is a bit rocky. It might take some time for your smartphone or your Amazon Alexa to connect with the 980. The 980 is great at collecting frustrating dog hair. It’s sold with a patented filter that captures up to 99.99 percent of dust, dirt, pollen, and allergens in the air. This is as good as any HEPA filter. It’s also sold with Dual Mode Virtual Wall Barriers. These barriers prevent it from entering any room you don’t want it to go in. Meanwhile, its Halo mode prevents it from going near any item, furniture, or appliance you don’t want it to. The 980’s a great product for any large or small home. It’s an impressive appliance that can easily outperform any upright vacuum cleaner. The Roomba 770 ‘s built with a 3-stage System which uses a combination of movement, suction, and brushing. This guarantees a clean, fresh carpet with every run. In addition, it’s equipped with Spinning Side Brushes. These brushes are great for dislodging stuck on dirt and stains from your walls. What’s truly great about this cleaner is its low profile and its simple operations system. Even the most technology-challenged individual can easily navigate and maneuver this self-driving vacuum cleaner. Not only that, but its low-profile design lets it slip under and around furniture with ease. The 770’s built with an iAdapt Responsive Navigation System. Its navigation system allows it to track where its clean and where it hasn’t cleaned. In addition, it also helps it clean around obstacles and clutter. Also, it features Virtual Wall Technology which prevents it from entering up to two rooms in your house. Moreover, this handy compact vacuum’s sold with a Self-Charging Station. Its Self-Charging function prompts it to return to the station when the battery draws low. While the Concentrated Cleaning feature is interesting and rather helpful, it can also be a hindrance. The Roomba 770 sometimes focuses on that one spot for minutes on end. Sometimes it drains its own battery by focusing on one location. Also, it’s important to note that the Roomba sometimes misses spots while it’s cleaning. Lastly, the Roomba 770 has a fairly poor suction. The 770 built with a remote control. This provides the ability to control it from the comfort of your couch. Its Concentrated Clean feature prompts the vacuum to detect and target dirt and dander anywhere in your home. It will then continuously clean that spot until the dog hair or whatever is gone. You can also set-up a pre-set week-long schedule for the appliance. It’s also built with a 6-month money back guarantee. The 770’s Concentrated Clean feature is very impressive. However, it pairs badly with the vacuum’s short battery. Nevertheless, this machine would make a great option for someone with a dorm room or a small apartment. The Roomba 870 is another great selling, easy-to-use, compact appliance. In fact, it comes with iAdapt Navigation which utilizes various sensors to maneuver around and navigate through your home. Its AeroForce 3-Stage System uses motion, suction, and brush power to clean your home until it’s spotless. Moreover, it’s also sold with filters that are comparable to a HEPA filter. This unit’s filter can trap up to 99.99 percent of dust, dirt, and allergens in the air, which makes it the best option for allergy sufferers. It also comes with tangle-free extractors which prevent hair and dirt build-up. The 870 comes with a handy Self-Charging Station. It’s designed to return to the station whenever the battery draws low. This guarantees that it’s full and ready-to-use whenever you need it. It comes with a XLife Extended Battery which ensures a battery that lasts 2x as long as a typical battery. This unit also features a Pre-Set Schedule function which lets you set the unit’s schedule for the week. Like the Roomba 770, the Roomba 870 tends to miss certain spots while cleaning. Meanwhile, its Concentrated Cleaning feature can quickly drain its battery. Another downside to this Roomba vacuum is fairly loud, and it tends to fall down stairs. Luckily, it is durable, and it can withstand a couple of drops. The 870 comes with Spinning Side Brushes which are perfect for scrubbing grime and stains from your walls. Not to mention, it comes with a Concentrated Clean feature that prompts it to detect and target dirt in your home. Its simple design is easy to navigate and maneuver. It also comes with a 6-month money back guarantee. Like all Roombas, the 870 features a handy, easy-to-use design. It’s guaranteed to clean your home, effortless. You’ll be happy with how well it performs and how long it lasts. Last on our list is the ILIFE V3s Pro. The ILIFE V3s Pro is a slim, easy-to-use machine that you can start with a simple press of a button. It also comes with a handy remote control which lets you control it from the comfort of your couch. Moreover, its Edge mode guarantees that this handy item can clean any wall or corner. It also features a compact, low-profile for slipping under your bed or your furniture. Also, it’s perfect for scrubbing thin carpets, cement, and hardwood floors. What’s more, its convenient scheduling system lets you program the robot to follow a pre-set schedule. This means that you can always return to a fresh, clean home, no matter how long you’re gone. Unfortunately, the ILIFE V3s Pro doesn’t have a very powerful suction. That’s why it’s recommended for hard floors or thin carpets. It also has a somewhat flimsy frame which makes it a poor choice for a home with stairs. The ILIFE V3s Pro is a handy unit that’s great for small apartments or dorm rooms. For example, it comes with a HEPA filter which filters out up to 99.99 percent of dust and allergens in the air. This makes it a preferable choice for allergy suffers and those with respiratory problems. Although it doesn’t include coverage, you can purchase this cleaner from numerous 3rd party vendors. In fact, many 3rd party vendors offer warranties and money back guarantees with their purchases. So, no matter what you’ll be protected when you purchase any ILIFE V3s Pro. The ILIFE V3s is a low-cost self-driving choice. Honestly, it’s not the most impressive unit on our list. However, it’s good option for someone looking to test out a decent quality cleaner. Now that we’ve reviewed our top 11 choices let’s check out our buying process. When filtering down our top robot cleaner options, we tried to think about what our readers needed. Obviously, vacuum cleaners can differ based on several factors. So, we focused our search on units that fit a minimum requirement. If someone needed a unit that was perfect for clearing dog hair, then all our picks had to be able to do this. When searching, we looked at robot vacuum that had a powerful suction. Obviously, it’s important to possess a powerful suction if you need to dislodge dirt and debris from thick carpets. Because these machines are notorious for having weak suction, we looked at units that also had features and abilities. Without a doubt, one incredibly handy ability is the Concentrated Clean feature that’s built into many iRobot machines. The Concentrated Clean function prompts it to target and clean a particular spot until it’s spotless. A Roomba’s Concentrated Clean feature is helpful because it works with its less powerful suction to clear stains and debris. We were impressed with cleaners that included a wide variety of features that helped to improve the overall performance. These appliances are all about convenience. If they’re not convenient and easy-to-use, then they couldn’t be included on our list. First, they should feature a sturdy frame; one that can withstand multiple falls or occasionally running into furniture. If they didn’t feature a sturdy-enough frame, then they had to have a good navigation system. In fact, many of our choices came with the latter of the two. Then we looked for robot vacuum that could conveniently complete other chores, making it a two or three-in-one product. No matter what, all our choices came with a charging station, as well as, the ability to return to the station when it needed. We liked appliances that came with either a warranty or money back guarantee. If not one of these, then it should be available in stores or via 3rd party vendors that offered one of these two. It’s not that we don’t have faith in our choices. We only believe that a superior product will provide the ability to either return or fix defects free of charge if the need arises. Moreover, it’s the mark of an exceptional manufacturer and brand. So, now that we’ve learned about the top 11 robot vacuums of 2019, it’s time to make a choice. Furthermore, you should remember that our top choices may not be the best option for you and your home. We took care to collect a diverse list of appliances that relate to both home and apartment owners. So, if you have a home composed mainly of thick carpets, you might want to consider an upright vacuum cleaner with a powerful suction. On the other hand, an apartment or a dorm with bare floors would require an extremely expensive appliance. Overall, every one of our choices is guaranteed to provide excellent results. Furthermore, always take into consideration what you and your home needs. Obviously, you’re guaranteed to find what you’re looking for on our list of top-selling robot vacuums of 2019. In brief, how did you enjoy our in-depth review of the best robot cleaners currently on the market? I encourage you to write a review. Have you purchased any of our top-selling choices? If so, how did it perform? Did it deep clean carpets? Would you buy it again?